About three years ago when I was at Lerer Ventures, I first met Carly Zakin, Co-Founder of theSkimm, through my friend Rob Fishman. At the time, she was working at NBC News as a Producer and wrestling with her next career move. We discussed a number of her options including joining a startup or building one from scratch. Later that winter, Carly was back in my office explaining that she was hours away from quitting her job to start a media company with her best friend Danielle Weisberg. Carly and Danielle ultimately launched theSkimm because they could not ignore a huge void in the market — they saw that their friends, who are intelligent and super busy, were not engaging with news in a way they enjoyed, fit into their routine, or made them keep coming back for more. theSkimm is the first company that has been able to transform news and information into a lifestyle brand. The team is obsessed with making it easier to be smarter and finding ways information can be streamlined into their audiences routines. Their first product, the Daily Skimm, is an email newsletter that arrives in your inbox every morning and provides all the news you need to know for the day. 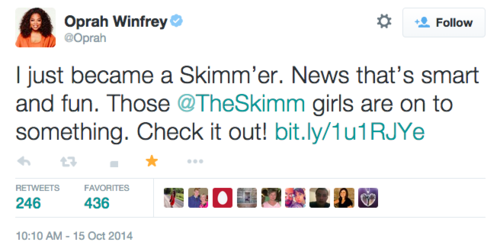 In essence, theSkimm is recreating what morning television means for their target audience. The numbers prove that Carly and Danielle are on to something big. theSkimm now boasts more than one million active readers, thousands of volunteer Skimm’bassadors in more than twenty cities, and an authentic voice that its readers trust. About a year ago, RRE invested in theSkimm’s seed round and I quickly realized it was much more than just a newsletter — it’s a brand and a community. Women all over the country are obsessed with getting their news and information from theSkimm. In fact, the most obsessed readers and evangelists, the Skimm’bassadors, have shared theSkimm with hundreds of thousands of new readers just in the last six months. Brands and publishers feel the power of the community. One author shot to the top 100 on Amazon. A well known fashion publisher had record daily traffic. And a featured product sold out in only hours. Conversion rates are some of the highest we’ve ever seen. We really knew Carly and Danielle were onto something huge not only because of Oprah’s love but also when we saw a lot of their recent growth had come outside their audience of millennial female urban-dwellers. For instance, men are now 20% of the community and that percentage is growing monthly. In fact, I was recently meeting with a senior executive at one of our portfolio companies and he mentioned mentioned how much he loved getting the news from theSkimm. This guy happens to be in his early 50s and lives in southern Connecticut so he’s not exactly in the core demo. This story and many others like it provide evidence that the brand and product has broad appeal. As someone who has seen theSkimm grow from idea to media company, I’m incredibly excited to announce that RRE is doubling down on Carly and Danielle to lead a $6.25m Series A financing with participation from Homebrew, Greycroft and some cool angels like Chelsea Handler. With the funding Carly, Danielle and the team plan to put even more attention and love into The Daily Skimm. Additionally, the team will be working hard to bring the voice and the community to other platforms and focusing on a variety of new categories. I truly believe theSkimm has a unique opportunity to build a category defining media company. I’m thrilled to work closely with Carly and Danielle to achieve the goal of helping everyone become smarter. Finally, if you’re not a Skimm’er do yourself a favor and sign up here. You’ll thank me later.